My name is Wajeeha, and I’m a garlic lover. I’m the kind of person who will find every opportunity to add garlic to my recipes. Except not to sweet stuff like these super soft & chocolatey cookies and this to die for Lindt Italian hot chocolate obviously. I may be obsessed with garlic, but I’m not pure crazy. 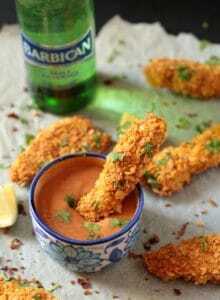 A few days ago I shared my recipe for Garlicky Chicken Nuggets which are super easy and fast to make. No breading involved. Isn’t that awesome? 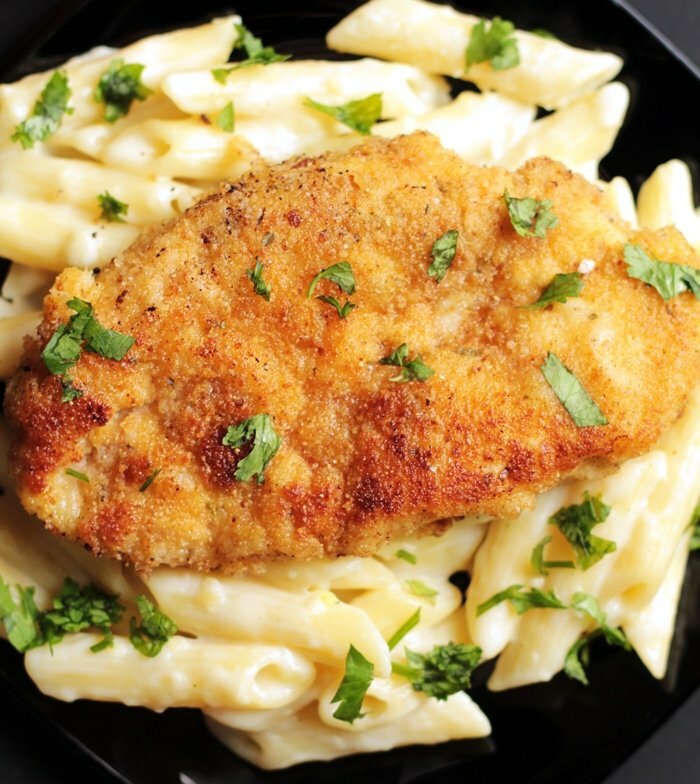 Now let’s talk about this Crispy Lemon Chicken with Creamy Garlic Penne Pasta. 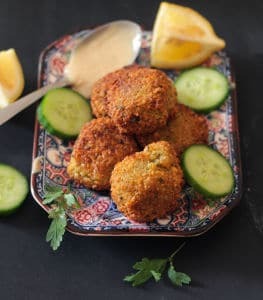 And today I want to share with you another garlicky dish that will blow your mind. This is a restaurant style dish with a base of creamy garlic penne pasta which takes like 5 seconds to make. And then there’s the star of the dish, the glorious lemon & garlic chicken which is coated in breadcrumbs and lightly pan fried. 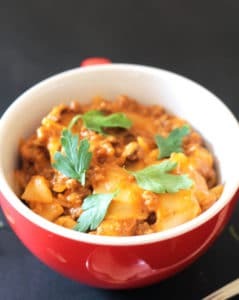 This dish is ready in 30 minutes and you don’t even have to dress up to go out (this is especially for parents of toddlers who want to eat at a restaurant but can’t take said toddler out in public because of fierce tantrums). Oh and guess what? The pasta is super creamy, but there’s no actual cream in the pasta sauce. Isn’t that awesome? And the chicken is fried in very little oil, so that’s even more awesome. You’re welcome. Now if you don’t like a lot of garlic in your food, then you can reduce the amount of garlic. But if you’re a garlic lover like me, then you will absolutely love this dish. Now go onto the kitchen, only 30 minutes between you and this delicious restaurant style meal. Random Thoughts on Garlic & Vampires: I feel sorry for vampires because they cannot enjoy the delicious flavor that garlic brings to any dish (I mean if vampires actually do exist and are allergic to garlic). I wonder if Bella from Twilight misses garlic bread? I wouldn’t have given up garlic bread (or anything garlic) in place of shining like a million diamonds in the sunlight. Was it worth giving up garlic for an eternal life, Bella? Yeah, if you’ve been reading this blog for awhile, you must know I’m slightly weird. Sorry, not sorry. 1.) Let’s talk about the chicken first. It needs to be breaded with bread crumbs and fried in very little oil. However, you need to make sure the heat isn’t too high or else the bread crumbs will burn. The quantity of oil used also depends on how wide and deep your pan is. If it’s a smaller pan, you’ll obviously need less oil…but if it’s a wider pan then you’ll need a little more oil for the frying. 3.) This pasta is best served immediately because the pasta tends to soak up the sauce pretty fast. 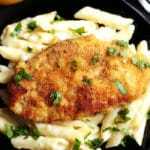 A restaurant style dish of lemony crispy chicken paired with an easy creamy garlic penne pasta. No heavy cream added to the pasta sauce, and very little oil needed to fry the chicken! Marinate the chicken breasts in all of the marinade ingredients. Marinade for 5-10 minutes. Place the flour, eggs, and breadcrumbs in three separate shallow dishes. Dip each chicken breast in flour, lightly shaking the excess flour. Gently dip in the egg wash and then coat with breadcrumbs. Repeat until all chicken breasts are coated with breadcrumbs. Heat oil in a frying pan, and fry the chicken breasts until golden brown (for about 2-3 minutes on each side or until cooked through). In a medium sized pot heat butter on medium high heat and saute the garlic for a few seconds. Slowly add in the milk and chicken stock, stirring constantly, to avoid lumps forming in the sauce. Once the sauce has thickened, season it with salt and pepper. Add the cooked penne pasta and mix until coated with the sauce. 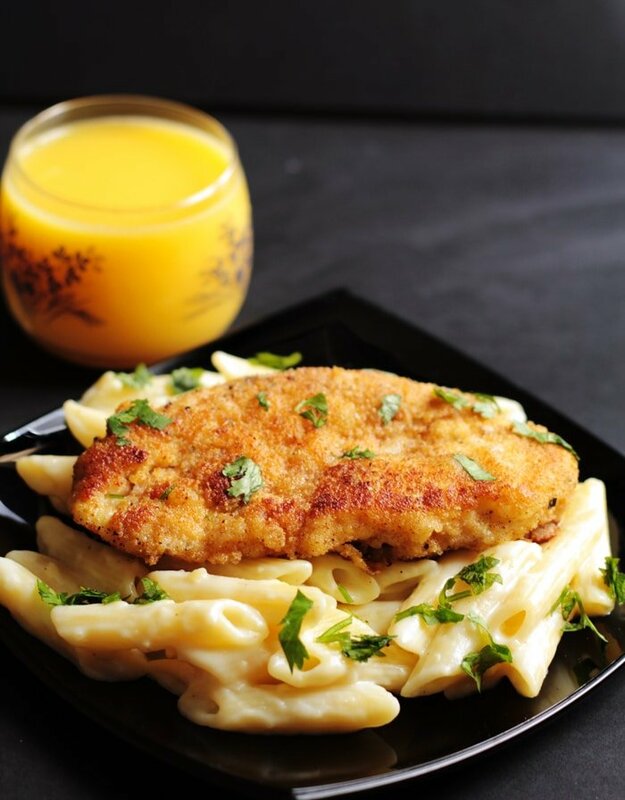 Serve pasta with crispy lemon chicken fillet and garnish with chopped parsley or coriander. Amount of Oil: I used a nonstick frying pan, so did not need to use a lot of oil to fry the chicken. However, if using a pan that's not nonstick then you may need to add more oil. For the Chicken Stock Substitution: If you don't have chicken stock on hand, just dissolve half a chicken stock cube in 1/2 cup of hot water and add this to the sauce instead. I used a Knorr chicken cube. Sounds easy and really looks restaurant quail! Pinned! Based on your obsession with garlic, we should probably compare notes!! I think the only things I don’t put garlic in are desserts!! 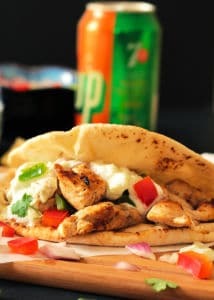 This looks soooo yummy & can’t wait to try!! I had no idea there were garlic haters in the world. They can all go sit with the cheese avoiders and cilantro-phobes. Yes, lemon and garlic can never go wrong! 🙂 Thanks for stopping by! Sure love the look of that creamy pasta with a lovely crispy chicken on top, amazing! This looks above and beyond! YUM! Creamy pasta is a such comfort food for any occasion! I love your recipe! I love lemon chicken and the addition of pasta to this makes it the perfect meal! I think I may have to make this for dinner. Yum, yum, yum! I love any dinner that starts with a plate of creamy pasta! Fantastic looking photos Wajeeha…love them..
Do you think the chicken will still be good if I were to bake it? I’m not sure as I haven’t tried baking the chicken. I suppose you could try baking it but since the chicken is coated in breadcrumbs it may not become as crispy as when it is fried. Please do let me know how it turns out, if you do try baking it! Can’t wait to make tomorrow. This looks fantastic! Want to make sure I have the correct amount of chicken, 250g = approx. 8 oz. Is that amount for the whole recipe? 4-6 servings (1.5-2oz ea)? can u use chicken broth ? from a can if u dont Have anything else. I made this for dinner last night. The lemon chicken was delicious. However the pasta needed more garlic but it was ok.
Aww that’s sweet Joshua! Glad they liked the recipe 🙂 Thanks for letting me know! Made this tonight. It was very good! I halved the recipe and it was more than enough for two people. This looks good but am I missing where the lemon comes into play? I dont see any mention of lemon in the ingredients or the instructions. There with you on Garlic! I and my daughters love loads of garlic in everything. I will have to try this sauce on my vegetable pasta it sounds yummy! This sounds delicious! I too love garlic. I use it in so many dishes. And it’s lemon season so I’m all about making lemon dishes. Yum! I am a big fan of garlic too. I love how easily this dish comes together. So perfect for weeknights. Yessssss! I’ll take this meal right now please! The chicken looks so delicious, crispy and golden. You just gave me a lunch idea to make for the family!! What would be a good side dish with this? Some garlic bread would be good with it!